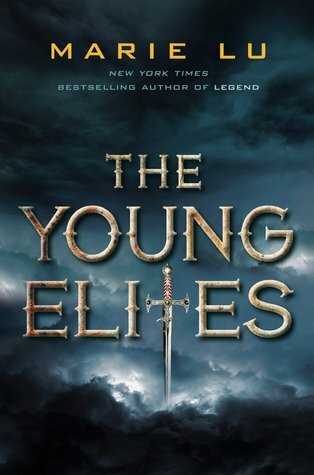 The Young Elites is the first book I've ever read by Marie Lu and I began here on a recommendation from a friend. I went in knowing very little about this series other than that everyone seems to love it. I wasn't really sure exactly what genre this book fit into and, upon completing it, I'm still not quite positive. Is it fantasy? Is it dystopia? Either way, I really enjoyed it! Adelina is the main character of this story and she is so, so refreshing! It isn't often you come across a character whose hunger for power pretty much overwhelms everything else. Adelina is a girl whose life has revolved largely around a lack of power. She lives according to her father's cruel whims, unable to defend herself. Until she suddenly she is able, and she likes it. Adelina is power hungry and vicious, but she's also incredibly easy to sympathize with. She cares deeply about her sister, and she just wants to be loved and fit in. I felt for her from page one and I'm eager to see how she grows in the next two books. As the bolded lines in the blurb show, there are other important characters here too. Enzo is the leader of the Dagger Society and love interest to Adelina. He was an intriguing character who I always wanted to know a little more about. The same can be said for Raffaele who is perhaps the one person Adelina feels closest to. My only real complaint is that the romance did seem a little insta-lovey. While it did end up working out okay, I never felt like I saw the romance happening - it was just suddenly there. You can't win them all, I guess. The world of The Young Elites really made the story come alive. I felt like I could picture the city and the tunnels underneath. I was completely convinced by the atmosphere the author created. That being said, I was still very unclear of where exactly the book was taking place. While the city was easy to visualize, I didn't feel like I had a firm grasp on the world as a whole. I'm hoping The Rose Society is able to explain things a little further. Plot is one area where this book does not suffer at all. There's magic, conspiracy, and romance - basically The Young Elites has all the elements that I love in a book! The story was fairly fast paced without many opportunities to get bored. The magical system of The Young Elites was fascinating and unique, especially Adelina's powers, which I am excited to learn more about. There were twists and turns to keep me guessing and the feels were real! If I was a crier I might have even cried once or twice. And then the ending totally blew me away! I didn't see it coming and now I'm dying to see what happens next in Adelina's story! The Young Elites definitely lived up to my expectations! Although this wasn't a perfect book, it was really enjoyable and I ended up loving Adelina. I found her to be unique among YA heroines and I'm looking forward to finding out what happens to her in the rest of this series. I do hope there will be more added to the world so that some of my questions are answered though.